Our Christmas Eve party went over nicely, the living room was ready, the fireplace set for Santa. Why was I so upset?! I was bummed that I didn't have anything set for my ATWT post. 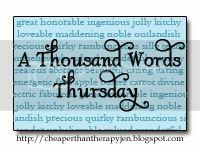 A first in the 42 weeks since I started my blog!! A travesty in my opinion. Luckily Christmas morning hubby reconnected my lifeline to the world. 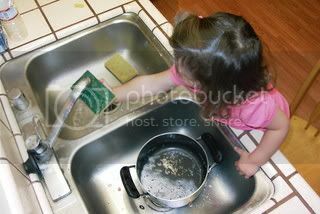 So if your kids, love water and soap...put them to work! I love your pic! I also had to laugh since we did the same thing. It really is great to have little helpers...at times. Cuuuuute! Does she do floors? I hope you had a Merry Christmas, Jen! 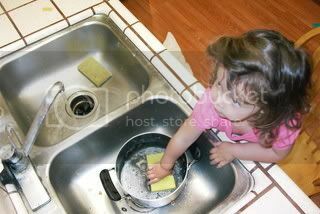 What's up with kids wanting to do dishes? My Chulo is always asking to do dishes! You make that little girl clean without rubber gloves? For shame! come over and see my girls play in water! Aw, how sweet! I think my son will be a great helper... at least I hope! Love it! My girls are washing up the kitchen as I sit at the computer...LIFE IS GOOD! I knew I had kids for a reason!! I love this picture! Hopefully lil' booger will be as helpful as your lil' one! LOL, my daughter loves to push the Swiffer around . . . I guess that's officially her first chore since I have her "swiffer" the living room everyday. She needs to earn her keep somehow! What a cute little helper. Good thing you have it documented. When she's fifteen, you'll want some reminders to yourself of how helpful she WAS! Thanks! Baby Girl likes to "sweep". Cute..I need to get mine on that. I just gave her a kids bar soap for the bath and she thought ti was the greatest thing, ever. Mine will dust. But only the one same spot, over and over and over again!